Well, it’s not quite tennis, but it’s close. Pop’n Smash can best be described as a cross between Pong and Breakout. Or, since it came out 9 months later, it might be easiest to call it a Sanrio World Smash Ball! clone. But a darn fine one it is. 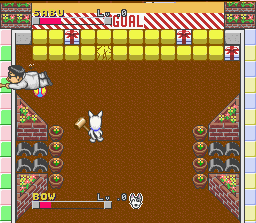 Heisei Inu Monogatari Bow: Pop’n Smash, to give it its full name, is based on canine Bow (who resembles Spuds MacKenzie), star of a popular manga and anime series. 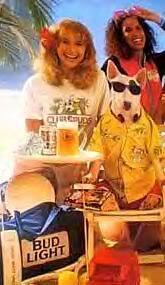 Spuds was famous for her Super Bowl ’87 commercial, by the way. Ah, Bow and Spuds has more than a passing resemblance. Socks the Cat? 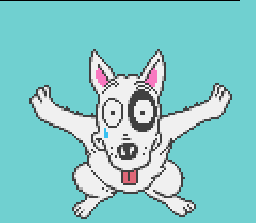 Give me Spuds MacKenzie, damnit! 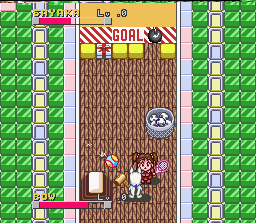 It controls and plays very much like Sanrio Smash, right down to the charging bar power shot (which can also hit the ball twice in succession under the right circumstances). Talk about shameless! So, what’s different? This game has more options. In Sanrio 2-player mode you have a choice of four characters and 20 stages. Here you have six characters and 30 stages. 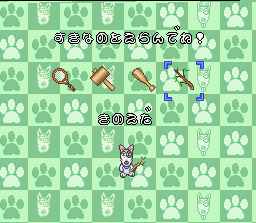 There are even 9 different tools to choose, ranging from mallets to baseball bats to brooms to even, a branch! I haven’t been able to discern if these various tools have pros and cons or if they’re just cosmetic, but nonetheless variety is the spice of life. 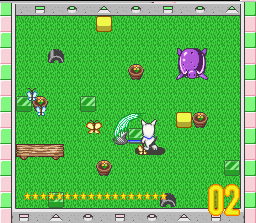 The 1-player version is limited to a choice of 4 tools (as seen above). Here, Bow opts for the twig over the tennis racket… I mean, wouldn’t you too? A no-brainer! 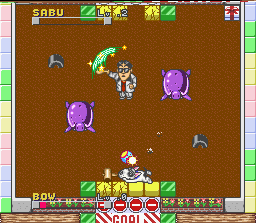 Even the power-ups here are similar to those found in Sanrio Smash. One eliminates all blocks protecting the opposition’s goal line. Another instantly gives you full power. But there’s at least one different icon: the bomb. You’re frozen in place for a good 4, 5 seconds if it touches you, leaving you mighty vulnerable and unable to protect your goal line. Pretty cool. You can also dive to make amazing last second saves and stops. Slide north, south, east or west by pressing Y and the appropriate direction. Good stuff I say. 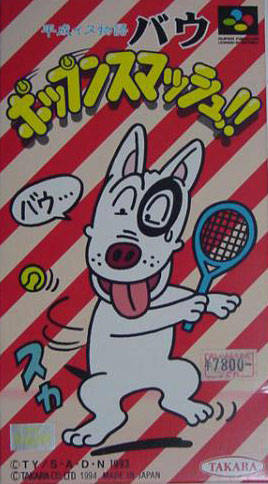 Sanrio Smash didn’t have this. 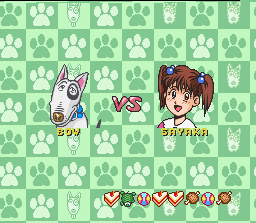 Go through each character in 1-player mode, with the VS. screen showing the password on bottom much like Sanrio. Hmmmm. What a copycat that Bow is! Another big difference: more freedom to roam. 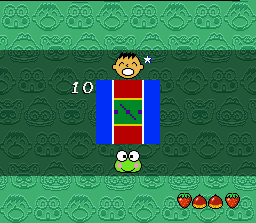 Many stages are void of restrictive X marks, unlike Sanrio. There are some stages with restriction points, but most allow you to go anywhere. I only wish you could beat up the opponent as well — what great fun that would be! 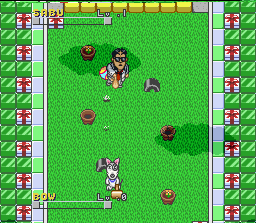 Sort of a Pong and beat ‘em up crossover, but alas, I’m digressing. C’mon, admit it, it would be sick if you could smack each other over the head with mallets and tennis rackets. Sanrio World Smash Ball! has restrictive X marks. They prevent you from crossing over to your opponent’s side of the field. But Pop’n Smash allows for more of a wild free-for-all, which is a refreshing little change. 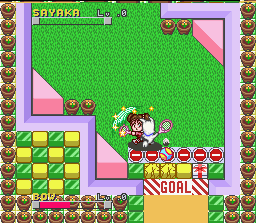 There’s also a “catch-as-many-butterflies-as-you-can-in-forty-seconds” mini game in the 1-player mode. It’s a nice break from the norm. Sayaka displays the power shot. Unfortunately for her, it is most ill-timed. 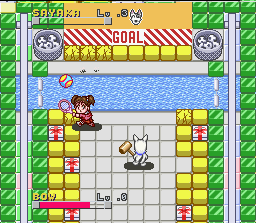 The ball will ricochet off the barrier and into her own goal line. D’oh! Certain objects are breakable, like those pots up there. I like all these environmental objects and items that you can interact with. 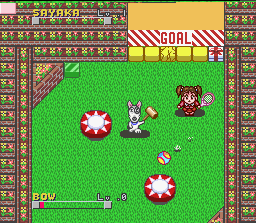 Sayaka’s helpless expression as the ball sails just past her reach is too cute. 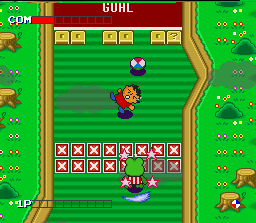 Pop’n Smash is a fun 2-player game and one of the many enjoyable Super Famicom-exclusive games that few folks ever talk about. Since it is a Sanrio Smash clone, it begs the question: which is better? Well, opinions will vary but here’s mine. 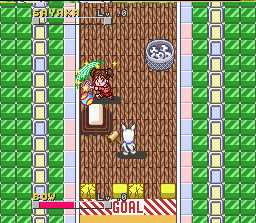 I really enjoy the little touches in Pop’n Smash. The additional options it has over Sanrio Smash — one might assume gives it perhaps a stronger lifespan and thus the overall edge. But Sanrio Smash plays better. I can’t put my finger on it, but it just feels a little bit more polished than Pop’n Smash. So at the end of the day, I have to give the slight nod to Sanrio Smash, but it’s super close. Both are really good though, and both are certainly worth having in your SNES collection. Although they’re similar, there’s just enough difference to warrant getting both. Both are great fun with a friend, and vastly underrated and unique titles.